Talk about a terminal case of Trump Derangement Syndrome. On Thursday, BizPac Review and others reported that Philippe Reines, a former top aide to Hillary Clinton, went on a trouser-less rant after a segment with Harlan Hill, a member of the Trump 2020 advisory board. 2) He told me to “clean the pubic hair off my face.” Whatever that means? According to Samantha Chang, Hill posted photos of Reines without pants, but the former Hillary aide blocked him. “We chirped back and forth, and he said, ‘You’re not half the debater you think you are.’ To which I said, ‘That’s probably the lamest, most D.C. diss I’ve ever heard,’” Hill told TheDC. Reines allegedly followed Hill through the newsroom screaming, and Hill started snapping photos of Reines’ pants-less suit. “Yeah, I know how I look. How about you wipe the pubic hair off your face?” Reines allegedly told Hill in response to his photo being taken. Reines blocked several Daily Caller reporters on Twitter after they retweeted Hill’s account of the incident. 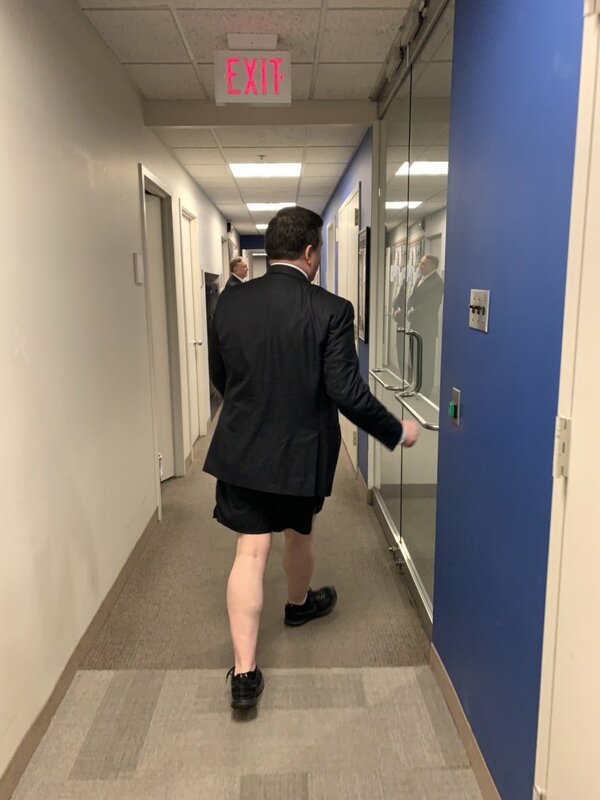 According to an anonymous eyewitness, Reines did not wear pants during a recent appearance on Tucker Carlson’s Fox News program either. Reines, Chang reminds us, is a “rabid Trump-hater” who frequently slams the president and those who work for him. Reines even referred to the entire Trump family as a “diseased clan,” Chang said. He has some serious psychological issues. That is priceless. No pants, no border wall. Now it all makes sense. This is PEAK Twitter win. None of the Clinton’s have clothes on and this surprised u why? ???????????????????????????????????? I thought it was funny when I saw that and thought it was photoshopped but dammmmmmm real life??????????????? ?